Montgomery Castle (Cadw)0300 025 6000work CastleMontgomery Castle is a stone masonry castle looking over the town of Montgomery in Powys, mid Wales. 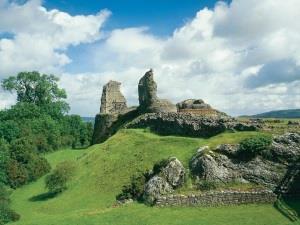 It is one of many Norman castles on the border between Wales and England. The original motte and bailey is now known as Hen Domen and was built at the order of Roger de Montgomery, earl of Shrewsbury some time between 1071 and 1074. On the rebellion of his son, Robert of Belleme in 1102 the castle was given to Baldwin de Boulers. It is from Baldwin that Montgomery gets its Welsh name, Trefaldwyn (Baldwins town). The de Boulers (Bowdler) family held the castle until 1215 when the fortress was destroyed by Prince Llywelyn ab Iorwerth. The motte and bailey was subsequently refortified as an outpost for the new stone castle and probably survived until around 1300. The rebuilding of Montgomery Castle in stone was commenced in the late summer of 1223 on the sixteenth birthday of Henry III of England, a mile to the south-east of the original site. The architect of the new castle was Hubert de Burgh who also rebuilt Skenfrith, Grosmont and White Castle in the Welsh Marches. From 1223 until 1228 masons worked solidly building the entire inner ward, or donjon as it was then known on a great rock above the later town of Montgomery. This work consisted of the gatehouse, two D-shaped towers and the apartments which crowded around the curtain wall of the inner ward. After an unsuccessful attack by Prince Llywelyn ab Iorwerth in 1228 the middle and outer wards were added to the castle. The castle was again attacked in 1233 which resulted in damage to the Well Tower which had to be subsequently repaired and reroofed. In 1267 Montgomery was the meeting place for treaty negotiations, where King Henry III granted Llywelyn ap Gruffydd the title of prince of Wales. Fifteen years later in December 1282 the army of Montgomery marched from here to Builth Wells to surprise and kill Llywelyn. After 1295 and the final Welsh War of the thirteenth century the castle became more of a military backwater and prison than a front line fortress. 1 April - 30 September 2019 Daily 10.00am - 6.00pm. 1 October 2019 - 31 March 2020 Daily 10.00am - 4.00pm Closed 24, 25, 26 December and 1 January. Montgomery Castle is located high above the town centre, at the top of Arthur Street.